When one looks out into their garden, they should be greeted by a plethora of colorful flowers that yield happy vibes. Gardens can be relaxing places where one retreats to decompress or a beautifully groomed oasis where one hosts events and parties. There is no better way to add a splash of color and creativity to a space than with the inclusion of flowers and plants. Whether you are looking to spruce up your current landscaping in Denver, or add a garden, now is the best time to do it! Flower beds add a whole other dimension to your garden design and create a sea of color that instantly elevates your property. There are many different types of plants that one can plant, but perennials are touted as an excellent choice due to their ability to thrive for several years. Unlike their other half, annuals, perennials continue to add texture and vibrancy to your garden even when they are no longer in bloom. The many beds they produce are not as finicky and can even tolerate shade. Below are five perennial flowers that you can add that will come back year after year! Unsure what perennial flowers are? Learn more about what are perennials. Add the vibrant and unique Peruvian Lily, also known as the Lily of Incas, to your garden! They make a great addition both in front of a home or even along the side as they can grow up to three feet fall. These flowers bloom in a variety of colors from red and yellow to orange and purple and resemble azaleas. Peruvian Lilies are also easy to maintain. The lilies do well in colder climates and perform best in a sunny environment. These are terrific flowers to add to a bouquet and will surely light up any room. Another great options for gardens with taller plans is the Geum Chiloense. Also known as the Red Dragon, this flower’s vibrant reds and oranges will add lots of color to your landscape design in Denver. It will grow to be about two feet tall, or less. Plus, this flower is known to steer away deer and rabbits but can attract beautiful butterflies and hummingbirds. A popular west coast landscaping addition is the Strawflower. Also known as a Paper Daisy, these teeter the line of a perennial and annual but are indeed a perennial. They grow to be up to three feet tall and bloom in a tight round shape. You will see these flowers in variety of whites, yellows, oranges, pinks and reds. Many also love this flower for its ease of cutting or drying. Strawflowers are a great addition to backyards-- display on decks, patios, porches and any nook or cranny that needs a pop of color. People with gardens in the northwest love the Fuchsia Plant. They are quite unique in shape with an exotic look. Fuchsia Plants are a great addition to a flowerbed or in hanging baskets or other containers. Parts of the plant are even edible! There are many varieties of fuchsia plants, each one with its own striking color palette. These are a great perennial if you are looking to impress folks. The bulbous blooms blossom non traditionally and add an alluring quality to your garden. The Forget-Me-Not produces a gorgeous small flower that is great to fill Denver landscaping with consistent light blue color. They have five petals and grow to be up to eight inches tall and resemble something that you would see in a meadow. 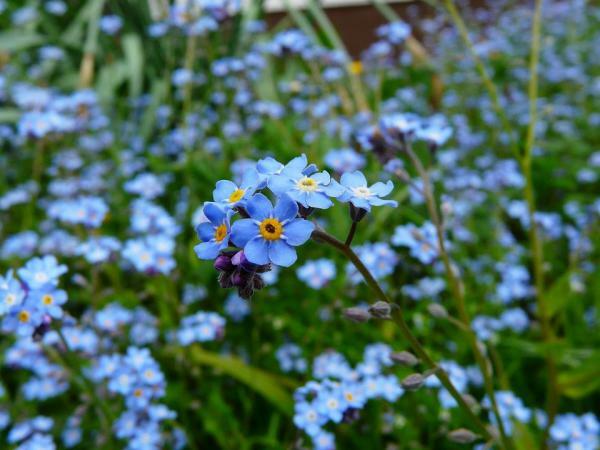 So why the name “Forget-Me-Not?” It’s quite interesting! The Aunty Flo website explains. These stunning perennials are low maintenance and take well to most conditions. Forgot-me-nots are easy to care for and don’t run into problems with pests. These are traditional flowers that are sure to inspire nostalgic memories. If you’re looking to add a vertical/linear flower to your garden, the Lupine is a great choice. They grow in a variety of lengths up to three feet tall. Lupines bloom in a variety of shades of orange and yellow to pink and red. This wildflower will give you the feeling as though you’re walking through a field when in fact you will be just in your own yard! Especially because similar to the Geum Chiloense, they attract hummingbirds and butterflies. Whether you are looking to liven up your current landscaping or need help with maintenance, you can count on us at Water Solutions Sprinkler Service to make sure you are covered. By having landscaping, you will increase your home value and our efficient watering methods will help you save on your water bill while keeping your garden looking beautiful! Give us a call at (720) 435-1495 or fill out a contact form to get started!